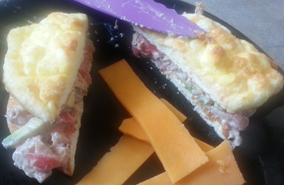 You are here: Home / Recipes / Low Carb Recipes / Carb Free Bread Recipe! I have mentioned before that I changed my eating habits a few years ago and lost over 100 lbs. One of the ways I did that was to eat virtually carb free. Well that meant I gave up potatoes, pizza, chips, bread and so on. Well, I have since found a way to be able to have pizza – I told y’all about my Carb Free Cauliflower Crusted Pizza. I use Mission Carb Balance Tortillas a lot, I even throw them in the oven for a few minutes to make chips with them, I also love to make and eat cheese chips. The only ones I haven’t figured out a “work around” for yet are bread and potatoes… until now! 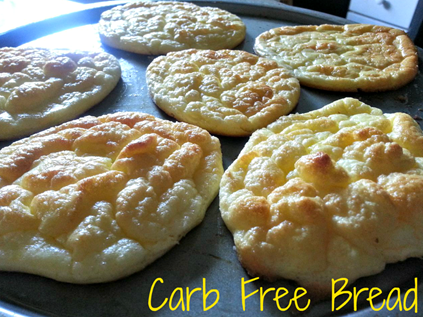 I recently found a recipe for Carb Free Bread! So, I made a video to show you how I made it! It’s so easy and fast and it only has 3 ingredients! Look at you cooking! So impressed. I will have to try it for Steve (same problem you used to have). Love you girl and miss you bunches. I hope Steve likes it! I enjoyed it! Thanks for the recipe! I’ll be trying this out. You’re welcome – I had the first sandwich I have eaten yesterday in 2 years! lol I can’t wait to have a hamburger! Do you have a list of carb free ingredients? I just started and have 18 pounds to lose by oct 1 ( five years worth of missed anniversaries and missed honeymoon) going to Las Vegas. I know I can have eggs, meat, certain vegies and now since I found your recipe I know I can have cream cheese. But what else is there? I’m so tired of meat and eggs and I’m beyond constipated now. Can anyone please help me? I want to continue this after my very majorly important date. I don’t, but I have found most yellow or white veggies are high in carbs. I eat meats, cheeses, veggies, salads, tuna, avocado, I love brussel sprouts and spinach, and broccoli. The oven temp is in the video along with the steps to make it! Please check the recipe on the website. Could be read as 14 teaspoons of cream of tartar. Thanks so much! I changed it. The video won’t play. Can you tell me how to get the rest of the directions? I really want to make this. Thanks! Also on a no/low carb diet. Here is the link tot he video on YouTube. Let me know if you still have problems with it. How do these store? Do they freeze well? I keep them in a plastic container in the fridge – I haven’t tried freezing them, yet. Curious, How many calories per serving? I don’t count calories, so I really couldn’t say. I am interested in how u lost your weight. I am over weight and trying to lose it, however, I always fail because of foods.